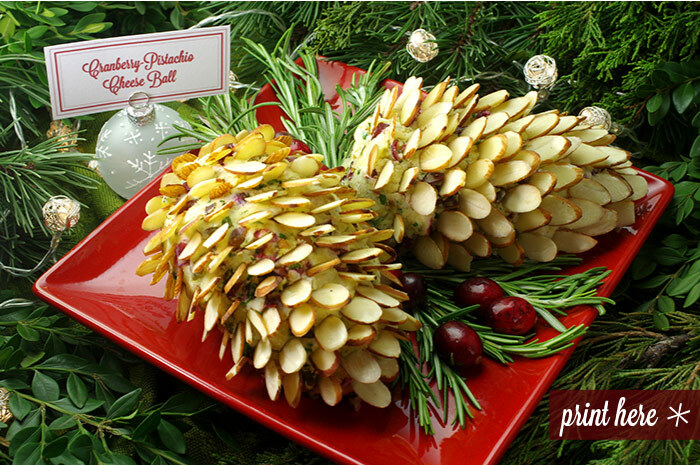 Put a seasonal twist on the table’s cheese ball with a little pinecone styling and garnishing. Of course, this presentation works with any cheese ball recipe, but we chose a cheese with a little kick, pepper jack, and some mix-ins that add a little holiday color. The complementary flavors blend together nicely with just the right crunch experienced along the way. The cheese ball’s personality emerges with some simple shaping and easy layering of almond slices. 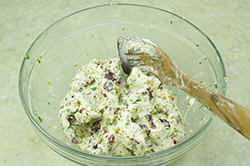 It’s an easy, yet elegant, appetizer for any holiday table. 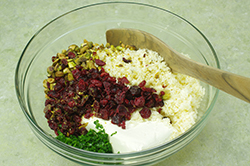 (1) In a medium bowl, mix the softened cream cheese, shredded pepper jack cheese, cranberries, pistachios, and chopped parsley, and stir until evenly combined. (2) Scoop half the cheese mixture from the bowl and roughly mold the cheese into a pine cone shape. Repeat with the other half. (3) Add sliced almonds to the surface of the cheesy pinecones by inserting and layering the nuts. Start at the “end” of the pinecone. Overlap the sliced almonds until the entire surface is covered. 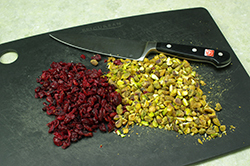 (4) Plate and garnish with a few long sprigs of rosemary and a few fresh cranberries. If not serving immediately, refrigerate. 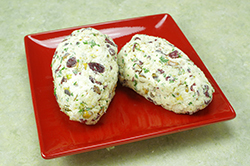 Remove from the refrigerator 30 minutes prior to serving to allow for softening. Serve with your favorite crackers. 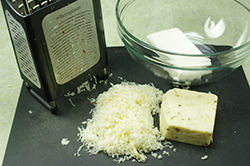 (1) Make the cheese ball up to one day ahead of time. Decorate with the almond slices a few hours prior to serving.